The state of Texas does not systemically monitor chronic absence or use it as an accountability metric. However, the state school funding formula factors in average daily attendance, a policy that means absenteeism can cost school district real dollars. 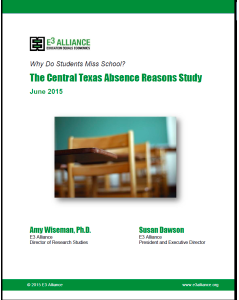 Chronic absence analyses have been released in three of Texas’s largest cities. The E-3 Alliance, a cradle-to-career initiative based in Austin, adopted improving school attendance as a key focus for school districts across Central Texas. The alliance emphasizes that attendance has a “triple bottom line” affecting students, teachers, and school resources. In 2011, the alliance launched Missing School Matters, a regional campaign including 14 school districts and more than three dozen business and community partners. Its goal is to increase average daily attendance by at least 2 percentage points, or an average of three school days per student each year. 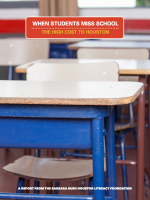 Since the campaign launched, the alliance estimates that the reduction in absences has saved Central Texas school districts $25 million attendance. For the past two years, the campaign has delivered the largest in-school flu immunization campaign in Texas history. This year, 19,413 vaccines were administered in 136 elementary and middle schools at no cost to parents or school. Although half of Central Texas students are low-income, they account for more than their share of absences due to mental health and absences due to family responsibilities, skipping, and logistical problems getting to school. Students at risk of dropping out are significantly more likely than their peers to miss school due to family responsibilities, logistical problems, skipping, out of school suspensions and legal reasons. About 21,400 or 9.3 percent of the nearly 231,000 HISD students missed 18 or more days during the school year. The district’s average daily attendance rate was 95.5 percent. Children from low-income families were more likely to be chronically absent than their peers. Chronic absence was high in preschool and kindergarten then declined before shooting up in high school. Students who attended school regularly were more likely to achieve at higher level on state standardized tests. San Antonio Kids Attend to Win is an initiative focused on improving daily school attendance to ensure students are kindergarten ready, reading on grade level by third grade, graduate on time and are prepared to succeed in college and career. It is sponsored by the P16Plus Council of Greater Bexar County, a Strive Together cradle to career initiative. During the 2014-2015 school year, P16Plus worked with 20 campuses within the San Antonio Independent School District and 30 campuses within the Harlandale Independent School District, both urban school districts serving a majority Hispanic and economically disadvantaged population. 12.8 percent of the students were chronically absent, defined as missing 10 percent or more of the school year. Nearly a quarter of 12th graders missed that much school, with girls missing more school than boys in their final year. 24 percent of economically disadvantaged students were chronically absent, compared to 6 percent of those with no economic disadvantage. 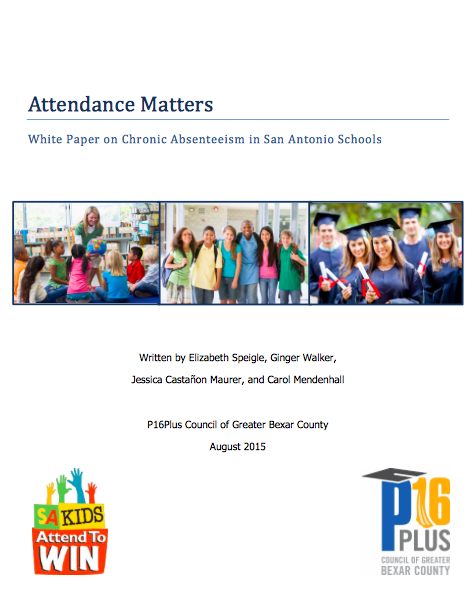 72% of the chronically absent students who receive interventions during the year improved their attendance rates, and 44% were no longer chronically absent by the end of the year.